Remington Premier 223 Remington Ammo 62 Grain Core-Lokt Ultra Bonded ammo for sale online at cheap discount prices with free shipping available on bulk 223 Remington ammunition only at our online store TargetSportsUSA.com. 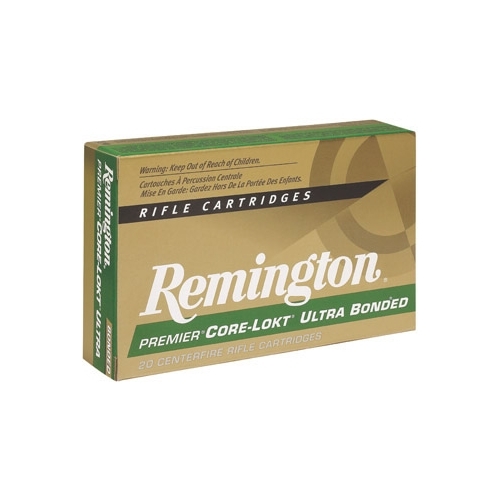 Target Sports USA carries the entire line of Remington ammunition for sale online with free shipping on bulk ammo including this Remington Premier 223 Remington Ammo 62 Grain Core-Lokt Ultra Bonded . Remington Premier 223 Remington Ammo 62 Grain Core-Lokt Ultra Bonded ammo review offers the following information; Remington HyperSonic 223 Remington ammo feature 62 Grain Core-Lokt Ultra Bonded Pointed Soft Point bullets. Remington Ammunition presents the shooter with an extensive variety of premium bullet developed to combine with the strict manufacturing tolerances to create ammo with which any shooter would be willing to take the perfect shot. Core-Lokt Ultra's lead core is bonded to a progressively tapered jacket allowing for reliable bullet expansion at all practical velocities. The bonding process keeps the bullet from fragmenting and allows for 95% weight retention with maximum penetration and energy transfer. This ammunition is new production, non-corrosive, in boxer primed, reloadable brass cases. Premier Core-Lokt Ultra Bonded is a bullet in a class of its own. Developed and designed by Remington's industry-leading R&D staff.